Last summer, Whitworth's 15th president, Robert Mounce, released his latest book, Jesus, in His Own Words, published by B&H Books. The book weaves together a continuous narrative of the four gospels, which, Mounce says, allows Jesus to tell his own story. The idea to write from Jesus' perspective came to Mounce while he was translating the gospel of John for another project. It seemed to him that writing from John's point of view was the best way to tell the story, since John was a good friend of Jesus. After completing that assignment he decided to expand his idea to all four of the gospels, allowing Jesus to be the spokesman. 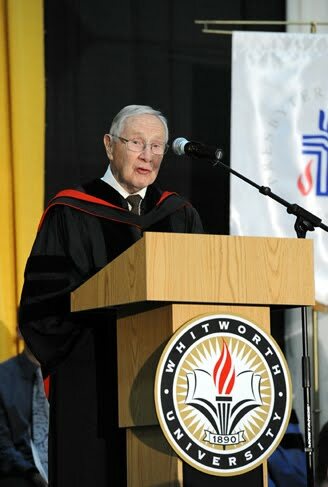 Mounce, who served as Whitworth's president from 1981 to 1987, says he hopes that readers will come away with a strong impression that Jesus himself has told his own story to them. "We call the Bible the Word of God and that is exactly what it is," Mounce says. "It is his word, that is, what he has to say. When it is read prayerfully, God speaks personally to the reader. It is an ancient text, that is true, but it is also the means whereby he speaks to us right now." Mounce says that while his other books were written specifically for a Christian audience, he intends for Jesus, In His Own Words to reach secular readers who may have an interest in spiritual matters. Mounce is the author, contributor, and commentator of more than two dozen books, most recently The Book of Revelation: The New International Commentary on the New Testament (Wm. B. Eerdmans Publishing, 2010), The Zondervan Green and English Interlinear: New Testament (Zondervan, 2008), and Expositor's Bible Commentary, Volume 10, Luke-Acts Revised Edition (Zondervan, 2007). Jesus, in His Own Words, is available at http://www.amazon.com/. The Whitworth bookstore will begin selling the book this November. Last fall, Mounce returned to campus, along with former Whitworth presidents Arthur De Jong and William P. Robinson, for the inauguration of President Beck A. Taylor.